Preheat your oven to 350 degrees. Take a large nonstick skillet out and stirring frequently, cook the sausage in it over medium-high heat for 6 to 8 minutes or until the sausage has crumbled and is fully cooked. Take the sausage out of the skillet and place it on a paper towel-lined plate. Drain the sausage of as much grease as possible, pressing it between paper towels. Wipe the skillet clean before moving onto step 2. Add the butter to the skillet and set the heat to medium. Once the butter’s melted, add in the green onions and 2 tablespoons of cilantro, stirring for 1 minute. Add the eggs, salt and pepper in. Let it cook (don’t mess with it at all) for 2 minutes or until the eggs start to set on the bottom. Gently draw the cooked edges away from the sides of the skillet, forming large pieces. Cook for 4 to 5 minutes or until the eggs are thickened but still moist, stirring occasionally (don’t overstir). 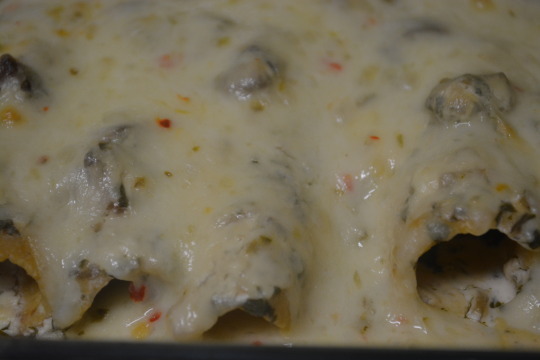 Take the skillet off the heat and gently fold in the sausage and 1 ½ cups of the Cheese Sauce. Take a 13 x 9-inch baking dish out and lightly grease the inside of it. Spoon about ¾ cup of the egg mixture down the center of each flour tortilla, rolling it up afterwards. Place it seam side down in the greased baking dish. Repeat with remaining tortillas. Pour the remaining Cheese Sauce over the tortillas, sprinkling it with the Monterey Jack cheese afterwards. Stick it in the oven for 30 minutes or until the sauce is bubbly (ours took 25 minutes but our oven runs a little hotter so your sauce may take longer to get bubbly). Serve with the desired toppings. Take a heavy saucepan out and add the butter to it, setting the heat to medium-low. Once the butter’s melted, whisk in the flour until the mixture looks smooth. Continue whisking constantly for an additional minute. Gradually whisk in the milk, turning the heat up to medium. Whisk constantly for 7 minutes or until it’s thickened. Once thickened, take the saucepan off the heat and whisk in the cheese and remaining ingredients until the cheese has completely melted. *It’s best to start making the sauce around the time that the sausage goes into the skillet. This breakfast dish has a lot of ingredients in it that mommy loves so we decided to try it out and it turned out delicious ! You can catch a nice level of flavor from the green onions in the egg mixture but nothing from he cilantro. The green onions don’t overwhelm the eggs. They just add a nice subtle flavor to them. 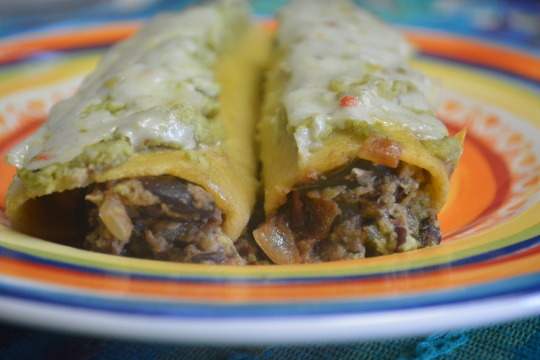 Even though we love the flavors of the yummy sausage, cheese sauce and the Monterey Jack cheese on top of the enchiladas they do start to feel a bit heavy on the tummy but the fresh ingredients help cut through that. The acidity of the tomatoes, “sharpness” of the green onions and the wonderful unique flavor of the cilantro all work so wonderfully with the enchiladas. This is definitely worth fixing again ! Preheat your oven to 350 degrees. Take a large skillet out and add the butter to it. Once the butter’s melted, add in the mushrooms and onion, stirring them around occasionally until tender. Toss in the garlic, cooking for an additional minute. Take half of the mushroom mixture out and leave off to the side for the sauce. Pour the broth into the skillet and cook for 2 minutes, stirring constantly. Add in the spinach and ¼ tsp. seasoned salt, continuing to stir just long enough for the spinach to wilt and the liquid to evaporate (we add in some kosher salt to bring out the flavors more). Take a large saucepan out and add to it the water, lime juice, chicken bouillon, garlic powder and the remaining seasoned salt, stirring to dissolve the bouillon. Turn the heat up high enough for boiling to occur. Once boiling, stir in the sour cream, cilantro and the mushroom mixture you had put off to the side (we actually turned our heat down because we were afraid of the sour cream breaking). Stir until the sauce is heated through. Get a 13- x 9-inch baking dish out and grease the inside (we used nonstick cooking spray). 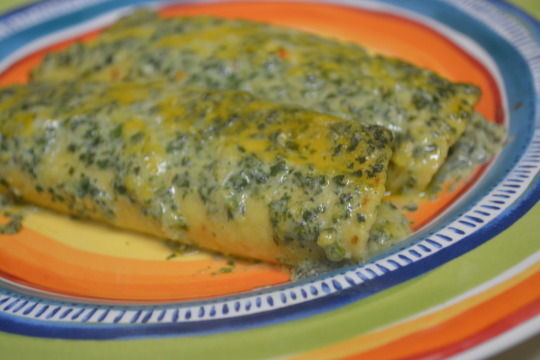 Take 3 tablespoons of the spinach mixture and place it down the middle of the tortilla. Roll it up and place it seam side down in the greased baking dish. Repeat with remaining tortillas until the filling is all used up. Pour the sauce over the filled tortillas, sprinkling the cheese on afterwards. Stick it in the oven for 14-18 minutes or until it’s heated through. Add pepper flakes on if you’d like. *We don’t know if we packed our 3 tablespoons of filling more than they did but for some reason we only had enough filling for 8 tortillas. As you can see from the first picture, this is a very cheesy dish. It was hard to get a good picture because this was oozing with all the cheese and the creamy sauce. While it may not be the prettiest looking, this is so delicious ! The sauce has a tanginess to it and two enchiladas were enough to have us feeling full. 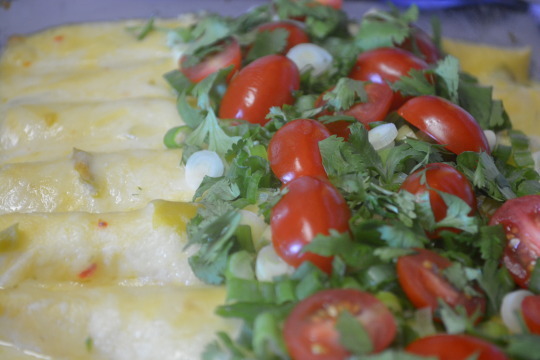 The enchiladas are great on their own but adding the crushed red pepper flakes brings a heat to the dish and makes it that much more scrumptious ! Preheat your oven to 350 degrees. Take a 13 x 9-inch baking dish** out and spray the inside of it with nonstick cooking spray. Take a large nonstick skillet out and spray the inside of it with nonstick cooking spray (we chose instead to use about 2 teaspoons of canola oil to coat the inside with). Heat the skillet over medium heat. Once hot, add in the zucchini, mushroom, onion and garlic, stirring frequently for 8 to 10 minutes or until the vegetables are tender. Add in the spinach and continue to stir for 3 to 4 minutes or until the spinach is wilted and most of the liquid has evaporated (ours took less time than that). Add in the beans, corn, diced tomatoes and chiles, and the cream cheese, stirring long enough for the cream cheese to melt. Stir 1 cup of the shredded cheese into the skillet as well as the taco seasoning. Once everything’s combined, take the skillet off the heat. Take a tortilla and spread about 1/3 cup of the skillet mixture down the middle. Roll the tortilla up to enclose the filling and place it seam side down in the baking dish (we had to tear off the ends of the tortillas to make them fit). Repeat with remaining tortillas. Pour the enchilada sauce over the tortillas, sticking the dish in the oven to let the enchiladas cook for 30 minutes. Pull the dish out just long enough to sprinkle the remaining ¾ cup of cheese over the top of the enchiladas and then stick it back in the oven for another 10 minutes or until it looks hot and bubbly***. Garnish with the cilantro and enjoy ! 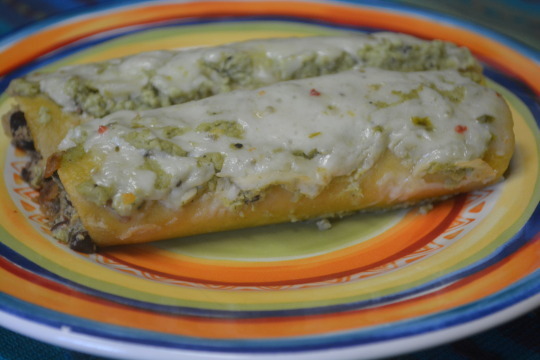 *When we first tasted this, it tasted “meh” enough that initially we weren’t going to post this but after sprinkling some salt over the enchiladas, it brought out the flavors enough that we changed our minds and decided it was worth posting. **When we first started making this, we had no idea how many tortillas it would take to use up all the filling. We could only fit 12 though in our 13 x 9-inch baking dish so we had to get another dish out in order to get them all in the oven. ***Maybe our oven runs hotter than theirs did but by the 10 minute mark, our enchiladas were starting to look like they got cooked longer than they should have so next time we make this, we’re going to leave them in for less time. While this is tasty, had we known how many enchiladas this was going to yield, we would’ve bought more enchilada sauce and shredded cheese. We got this recipe from a Paula Deen magazine. We weren’t paid in any form to promote Rotel, Lawry’s, Old El Paso or the Paula Deen magazine. Preheat the oven to 375 degrees. Take a large nonstick skillet out and place it on the stovetop (they never say what to set the heat to so we just went with medium heat), once heated add in the spinach and stir until wilted. Drain the spinach (we didn’t have any liquid left in the skillet by the time the spinach wilted) and place it on a plate for the time being. Now that the skillet is empty, add in the butter and let it get completely melted. Stir in the flour until the mixture looks smooth. Gradually pour in the cream and milk, bringing it up to a boil. Stir constantly for 2 minutes or until it gets slightly thickened. Add the chilies, green onions, cilantro, garlic, spices and spinach into the skillet, stirring to combine*. Take the skillet off the heat and allow the skillet mixture to cool down a little before it gets placed in a food processor. Put the lid on the processor and process until the sauce mixture is pureed. Stir in the sour cream and leave the sauce off to the side for now (we put the pureed sauce in a mixing bowl before combining it with the sour cream so that we knew everything was completely mixed together). Take a large mixing bowl out and combine the cheeses together in it, scooping 1 cup of it out and leaving it off to the side for now. Add the onion and cilantro into the large mixing bowl with the cheese, stirring to make sure everything’s equally distributed. Take a 13-in. x 9-in. baking dish and grease the inside of it (we used nonstick cooking spray). 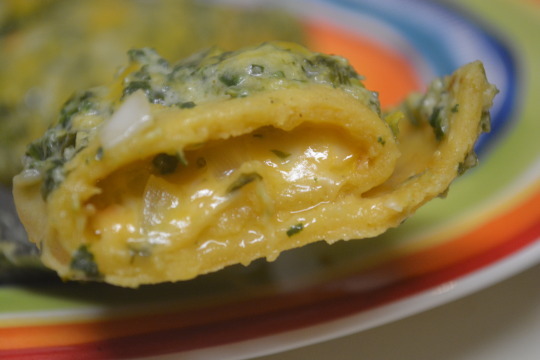 Take one of the warmed tortillas and place close to ¼ cup of the onion cheese mixture down the middle of it. Roll the tortilla up and place it seam-side down in the greased baking dish. Repeat with remaining tortillas**. Pour the sauce over the top of the enchiladas, followed by sprinkling that 1 cup of cheese afterwards. Stick the dish in the oven, uncovered, to cook for 25-30 minutes or until it’s heated through. *We thought the sauce tasted a little bland so we added some salt and it tasted much better, really helped bring out the flavors ! 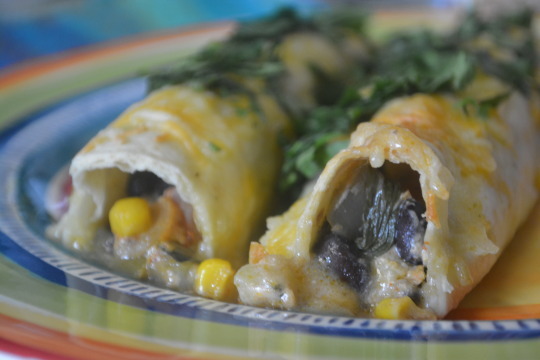 If you love cheese then you’ll love these enchiladas ! The onions add a crunch to the dish that would be missing otherwise. Take a medium-sized saucepan out and pour the two tablespoons of oil in, setting the heat to medium. Once the oil’s hot, add in 1 tsp. of cumin along with the flour and tomato paste, whisking constantly for 1 minute. After that minute passes, whisk in the broth and water. Turning the heat up if necessary, bring the sauce mixture to a boil. Turn the heat down now so that the sauce is at a simmer and let it cook for 5 to 8 minutes or until the sauce has slightly thickened. Season the sauce with salt and pepper (we used around ½-¾ tsp. of salt and ¼-½ tsp. of pepper) and leave it off tot he side for now. Now we get started making the filling ! 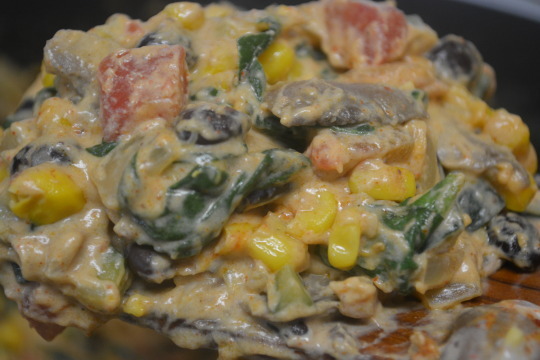 Take a large mixing bowl out and mix together in it: 2 cups of the cheese, beans, spinach, corn, scallion whites, and the remaining cumin. Season with salt and pepper (we used roughly ½ tsp. kosher salt and forgot to measure the pepper). Preheat your oven to 400 degrees. Take two 8-inch square baking dishes out and lightly oil (or spray with PAM like we did) the inside of the dishes. Stack all the tortillas and wrap them in damp paper towels, microwaving them for 1 minute on HIGH or if you’d like, stack and wrap the tortillas in aluminum foil before placing them in the oven for 5 to 10 minutes to get heated up. We actually just heated our tortillas up one at a time in a small skillet over LOW heat. Take each heated tortilla and place a heaping 1/3 cup of filling down the middle. 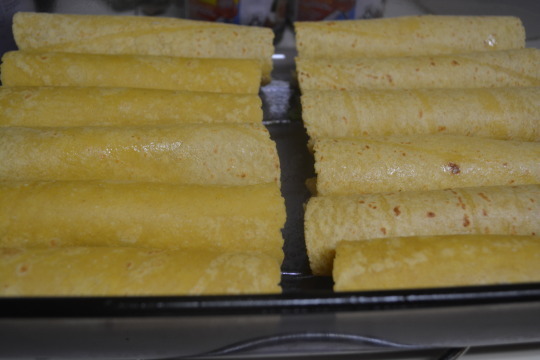 Roll up each tortilla tightly and place them in the baking dishes, seam side down. We actually had some filling left over afterwards so we just spread it out around the end of the enchiladas. Take the sauce and spread it evenly over the enchiladas, followed by the remaining cheese. 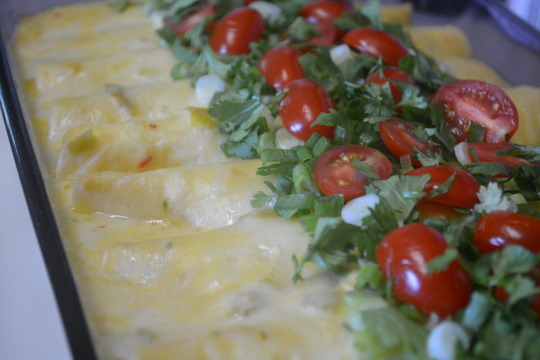 Stick the dishes in the oven to cook, uncovered, for 15 to 20 minutes or until the enchiladas are hot and bubbly. 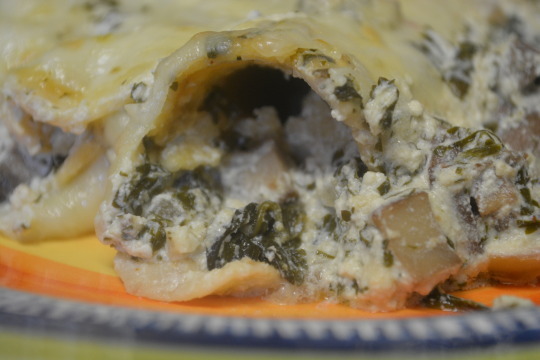 Pull the dishes out and sprinkle the scallion greens over the top, letting the enchiladas sit for 5 minutes before serving. We love this dish ! It could be nostalgia, but the sauce flavor and the textures of the tortillas reminded us of these really tasty frozen t.v. dinners we used to get that aren’t sold anymore. The additional sliced green onions that we chose to add on add a really nice sharpness and crunch. We weren’t paid in any form to promote PAM.